Japan is situated in the collision area of four great lithospheric plates: the Eurasian/Chinese Plate, the North American Plate, the Philippine Plate and the Pacific Plate. The continuous movements of these plates generate a lot of energy released from time to time in earthquakes of varying magnitude and effects and so unfortunately catastrophic earthquakes are nothing new for this region. Destructive earthquakes occured in Japan for several times in the last centuries. From 1930 until today 10 stronger earthquakes have killed more than 18.000 people and destroyed hundreds of thousands of buildings. Many earthquake were associated also with devastating tsunamis. 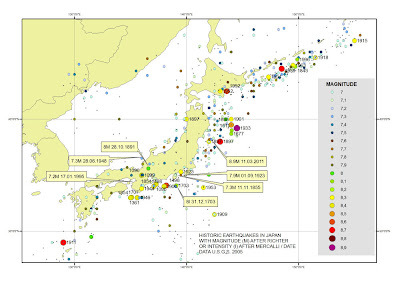 Written Japanese records of strong earthquakes and their aftermath date back at least 1.600 years. Until 1860 however Japanese naturalists were less interested in exploring the cause of earthquakes than their effects, and mythical explanations and divine intervention prevailed. Fig.1. 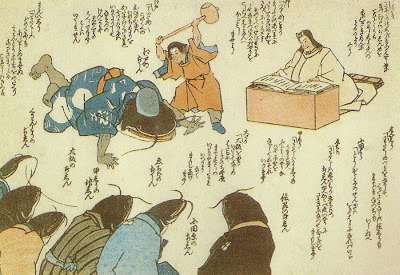 This wood print of the year 1855 shows the god Kashima overlooking the sentence of the giant catfish Namazu, accused to have caused the devastating Edo-earthquake in 1855. A helper of the god - a daimyojin - uses a big hammer to beat the magic capstone into the head of the catfish and immobilize him. The scene is observed by an assembly of small catfishes, representing earthquakes of the past (from BOLT 1995). In the year 1600 the Japanese nobleman Tokugawa Ieyasu chose the village of Edo (modern Tokyo) as his new residence, three years later it was the capital of the unified Japan. The city rapidly grew and soon reached hundreds of thousands of inhabitants - one of the largest cities at the time. Unfortunately this strategic position at the bay of Tokyo was and is also a highly seismic area. Fig.2. 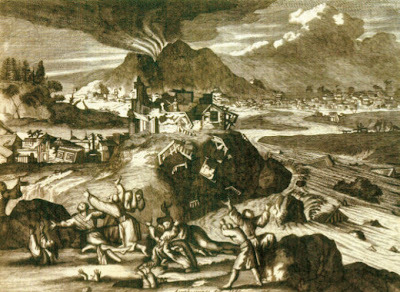 Copper engraving published in 1669 by an anonymous European artist possibly illustrating an earthquake in Edo (modern Tokyo) in the year 1650. It is not clear if the artist experienced the earthquake himself or based this figure on eyewitnesses' accounts of unspecified earthquakes, nevertheless it presents one of the oldest known illustrations of a Japanese earthquake (after KOZAK & CERMAK 2010). 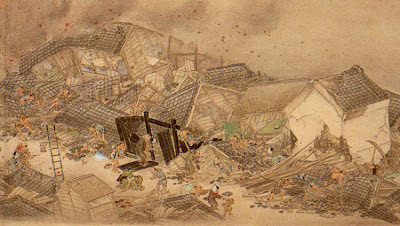 December 31, 1703 Japan was hit by a strong earthquake (with an estimated intensity of 8 after the Mercalli-scale), in Edo most of the buildings constructed of wood collapsed. More than 6.500 people were killed by a flood wave, which caused havoc in the bay of Sagami and on the peninsula of Boso. This earthquake and its aftermath effects, like flood and fire, killed estimated 150.000 people. One of the most remembered earthquakes hit Tokyo on November 11, 1855 (the Ansei-Edo earthquake). It was one of the most destructive quakes (with a magnitude of 7.3), killing estimated 16.000 - 20.000 people. 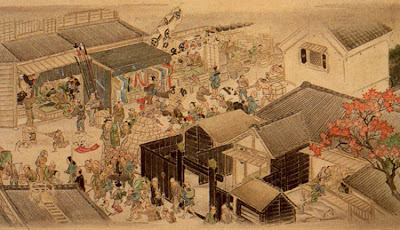 From this event many woodblock art prints still exist, displaying the destruction and telling of the despair of the survivors. Fig.3. and 4. Anonymous contemporary woodcuts of Edo before and after the great 11 November 1855 magnitude 7.3 Ansei-Edo earthquake, from KITAHARA et al. 2003. October 28, 1891, the agricultural Nobi region, north of the city of Nagoya, experienced an earthquake of magnitude 8. Modern buildings made of bricks as wooden traditional houses were heavily damaged or collapsed, hundreds of thousands became homeless and 7.000 people were killed. The English geologists John Milne (1849-1913), who in 1880 founded the Seismologists Society of Japan, studied the effects of the earthquake and published an important monographic work "The great earthquake in Japan, 1891". The Japanese geologist Bunjiro Koto observed a superficial dislocation of the landscape by 4 meter as the origin of the earthquake and recognized a fundamental principle in seismology: that faults are not the result of an earthquake, but its cause. During the second half of the 19th and early 20th century scientific research on earthquakes became rapidly established in Japan. "Currently the immediate area of Tokyo is seismically quiet while in the mountains around Tokyo in a distance of about 60 kilometres there are often triggered earthquakes, which - although they are may felt in the capital - are in fact harmless, because the affected areas are not part of a larger destructive seismic zone. Over time, the seismic activity in these areas will gradually diminish, meanwhile it will increase as compensation in the bay of Tokyo and will possibly cause a strong earthquake. An earthquake with an epicentre at some distance from Tokyo would be have a half-destructive, local impact." One year later, September 1, 1923, the city of Yokohama and Tokyo were hit again by an earthquake, today remembered as the Great Kanto- earthquake with a magnitude of 7.9 on the Richter-scale and the epicentre situated in the bay of Sagami. More than 99.000 people were killed by the collapse of buildings, a 10 to 12 meter high tsunami and a fire that raged for 2 days in the city. The bodies of possibly more than 40.000 people were never found. The first day of September is today a national day of remembrance for the dangers of earthquakes. "The cement of the floor crashed. Dishes and tables were spun into our faces and we all found us in a mad dance…… when I found myself near the entrance, I moved into it's direction. But the floor slipped away under my feet and I rushed against a crumbling wall." Mydans turned back to get his camera and in the next 15 hours documented the desperation and destruction of the 7.3 magnitude that destroyed Fukui and killed 5.131 people. Fig.5. A woman tries to escape, avoiding large fissures opening in the ground. 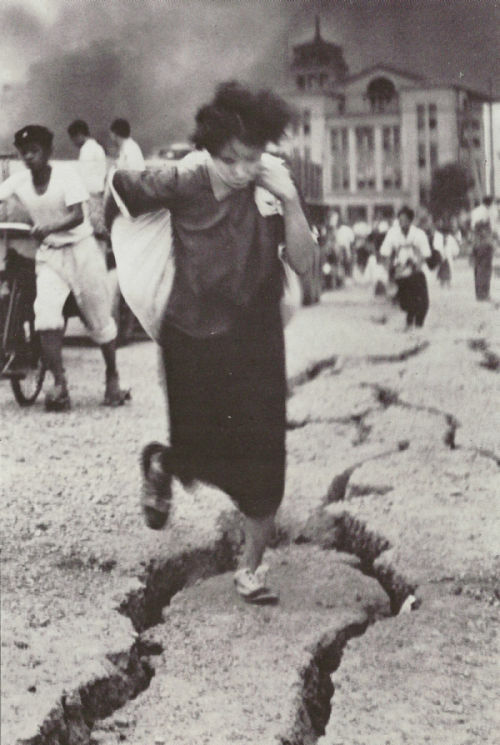 The photographs by Carl Mydans are unique documents of the terrible aftermath of the Fukui-earthquake of 28. June 1948. According to Mydans, most of the victims perished entrapped under the debris or in the fire after the earthquake. Shocked by the lack of tools to remove the debris, Mydans promoted the distribution of emergency-boxes, equipped with an axe and other heavy tools. In January 1995 the industrial city of Kobe was heavily damaged by an earthquake with a magnitude of 7.2 after Richter, the strongest earthquake in Japan since 1923. More than 6.000 people were killed and more than 300.000 people lost their homes. The recent tragic earthquake of March 2011 with a magnitude of 8.9 (possibly 9.1, there is also a map showing the intensity after Mercalli) is covered by various geobloggers. Fig.6. 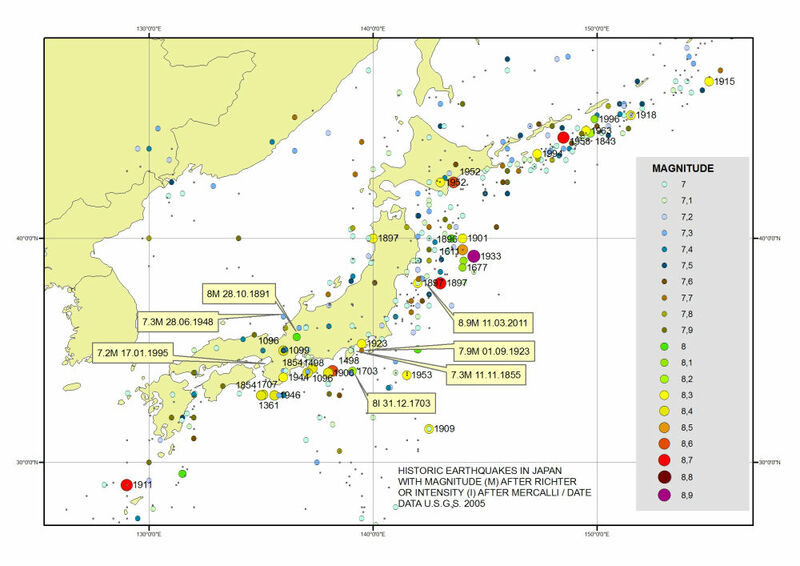 Map of Japan showing a selection of earthquakes with a magnitude greater than 7 after Richter in the last 100 years and major historic events (data from U.S.G.S. 2005, file download from Exploring Africa's Physical and Cultural Geography using GIS), see also Seismicity of the Earth 1900—2007, Japan and Vicinity. KITAHARAK, I. et al. (2003): Documenting Disaster, Natural Disasters in Japanese History, 1703-2003. Nat. Museum of Japanese History, Chiba. It was pretty random but i found alot of information valuable.